Do you remember the childhood story Stone Soup? It’s an old folk tale about a couple of hungry travelers who creatively entice hesitant villagers to fill their large cooking pot with delicious soup ingredients. After the initial refusal of the villagers to feed the hungry travelers, the two men fill their pot with stream water, light a fire under it, and then add a large stone to the water. A curious villager asks what the men are doing. The travelers tell her they are cooking delicious stone soup, and that they would be happy to share it, except that it has not reached its full potential yet. They explain to each inquiring villager that with just a few spices and some vegetables the soup will be ready. So, desiring to enjoy the delicious stone soup, one by one each villager is happy to give up a vegetable and a smidgen of spice. 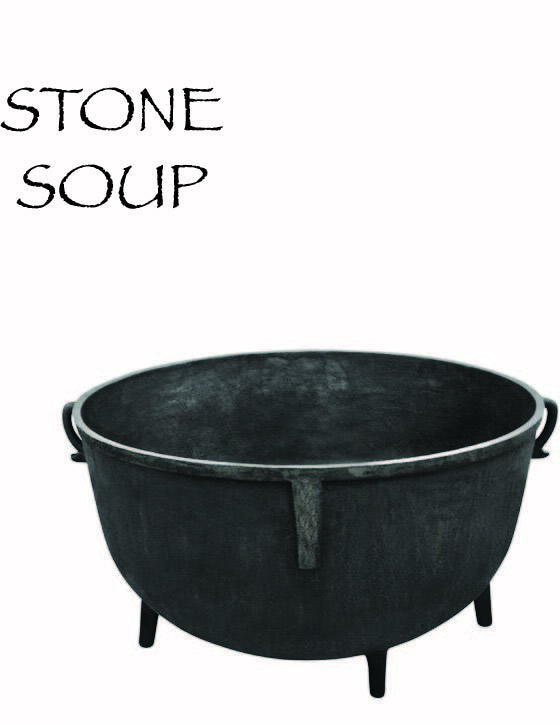 After cooking is complete, the stone is removed, and all of the gathered villagers, along with the travelers, enjoy together a wonderful helping of stone soup. This delightful moral tale teaches that when we share what we have with those who have little or nothing, there is indeed enough good food, and other basic necessities, to go around for everyone. And that the act of sharing has the potential to bring us together as a village and even as a global community. But in the village of Riimenze, in South Sudan, stone soup is not a charming moral tale, it is a tragic reality! In a very sad and compelling video posted at Sudan Relief Fund’s website, Catholic Bishop Eduardo Hiiboro Kussala of the Diocese of Tombura-Yambio in South Sudan, explains that with civil war violence showing no end in sight, his greatest challenge is to somehow supply food and clean water to several thousand internally displaced persons who have very little, and in many cases, absolutely nothing. Please watch Bishop Kussala’s video message, and then kindly consider making a donation (see: https://bit.ly/2GTkJzX). Recently I interviewed Father Daniele Moschetti, who for six years was provincial superior of the Comboni Missionaries of the Heart of Jesus in South Sudan. He said the civil war there is especially bloody in regions where oil wells are exploited by corporations from nations including the U.S., Canada, China and Malaysia. And he lamented that in just 2014 alone the South Sudanese army spent $1 billion on weapons from the U.S. and other weapon exporting countries, while millions starve (see: https://bit.ly/2HfTS1c). Fr. Moschetti also explained that large amounts of money from the U.S. and other donor nations, has been stolen by numerous government and rebel leaders. Therefore, he asked that we contact our national representatives (U.S. Capitol switchboard: 202-224-3121) and urge them to insure that all funds appropriated for emergency and development aid to South Sudan be more closely monitored to guarantee their intended use to improve the lives of desperately poor and war-torn South Sudanese. South Sudan is an all too familiar example of the horror unleashed when humans worship the gods of money and power instead of the God of peace, social justice and love.